I'm trying to take it back to the basics and let my poor belly rest. Today for lunch I went to Whole Foods and walked around for 20 minutes because I couldn't figure out what to eat. I settled on tuna/avocado sushi. I've had this sushi a hundred times before and I have checked the label each time to make sure it's still gluten free. 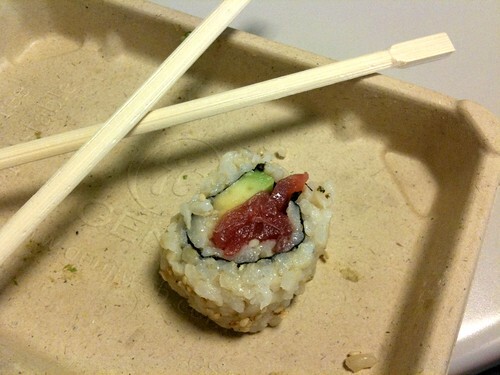 Today I did the same thing and noticed that this sushi has added sugar! Well that's annoying. There is sugar in everything! Apparently it's in the rice, which makes sense because the rice does taste kinda sweet. Oh well, it was still a good, safe, easy lunch and I enjoyed it. Tonight I'm getting back to my 5K training, last run of week 4. I can't believe I'm almost halfway there! I hope it goes better than the last run which was brutal. I am feeling much better now though. I'll have a recap tomorrow!